[Robert Remak, Jewish Polish-German embryologist, physiologist, and neurologist, pioneer in field of cell theory.] Autograph Letter Signed ('Dr. Remak') in English, asking 'Professor Queckett' [J. T. Quekett] where to get the 'gold size' he uses. 'Unter den Linden 68', Berlin; 15 February 1855. 1p, 12mo. On piece of grey tissue paper. Aged and worn, with thin strip of paper from mount adhering to reverse, which carries a seal ('R R') in red wax, and is addressed to 'Professor Queckett [sic] of the University of London from Dr. Remak of Berlin'. (For Quekett, who was in fact Professor of Histology at the Hunterian Museum of the Royal College of Surgeons, see his entry in Oxford DNB.) Twenty lines of text, in English. He has a 'demand' to make of Quekett: 'A year ago Mr.
[Sir James Paget, eminent pathologist.] Autograph Letter in the third person, declining to dine with the Hunterian Society. 24 Henrietta Street, Cavendish Square [London]. 3 February 1852. 1p, 12mo. In fair condition, on aged paper, with thin strip of paper from mount adhering to reverse of second leaf of bifolium. Reads: 'Mr. Paget regrets that an engagement for the Evening of February 4th. prevents his having he honour of accepting the Invitation of the President, Vice-Presidents and Council of the Hunterian Society'. From the distinguished autograph collection of the psychiatrist Richard Alfred Hunter (1923-1981), whose collection of 7000 works relating to psychiatry is now in Cambridge University Library. 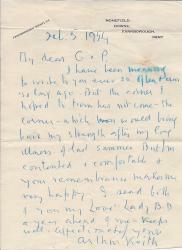 A large quantity of material, mainly letters, from the personal papers of Lionel Norbury and Family, including a substantial correspondence between Norbury and his wife, Grace (nee Rogerson), who worked as a Nurse, their correspondence throwing light on medical activity during the First World War and later. Eight Autograph Letters Signed from the Scottish anatomist Sir Arthur Keith to Grace Norbury, wife of Lionel Norbury, Professor of Surgery. Between 1948 and 1954. Six on his letterhead at Homefield, Downe, Farnborough, Kent; two on letterheads of Buckston Browne Research Farm. A total of twelve 12mo pages and two 4to pages. All texts clear and complete. Good, on lightly-aged paper. The first letter addressed to 'Mrs Norbury', and the others to 'Grace'. 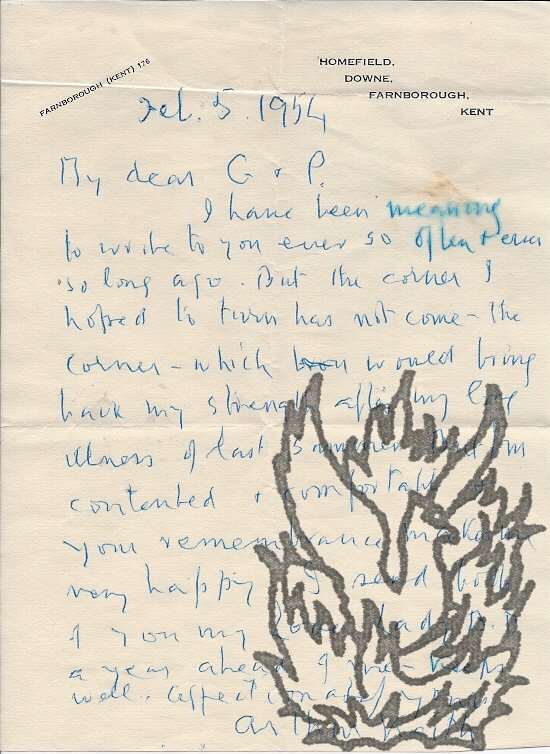 After a first letter of 1948, in which he complains that he is 'becoming more & more a home dweller', the correspondence continues in 1951, with Keith thanking Mrs Norbury for a gift of sugar ('Its arrival made my housekeeper Miss Holman quite elated'), and sending Lionel Norbury encouragement on his Hunterian Oration ('My heart goes out to the Orator & to his Better Half').